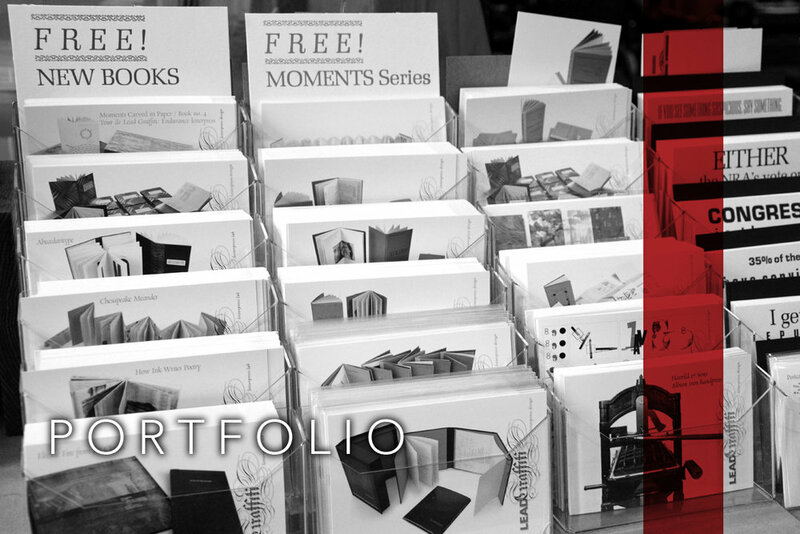 We produce free “portfolio cards” for all of our major projects and for some smaller ones we especially like. When at Lead Graffiti feel free to take any you want. WHETHER PRINTED OLD SCHOOL OR NEW SCHOOL, work from Lead Graffiti covers the hors catégorie as well as the more usual range of books, broadsides, certificates, and invitations. "In a faceless corrugated steel warehouse in an industrial park just outside Newark, DE lies one of the most experimental letterpress shops in America, and doubtless, the world: Lead Graffiti. LG is the incorrigible, unpredictable, and uncompromising brainchild of Ray Nichols and Jill Cypher — a shop where the only rule is there are no design rules, and the thing you learn every day is that there’s always more to learn." We couldn't have said that better ourselves. Below shows our spread from Chris’ book. When printing for you as the client, we typically use digitally-designed photopolymer plates to provide more typographic and image control for your project. We like big projects. Not necessarily in scale, but in impact. It might be 39 colors used to print a calendar, or it might be a Nobel Prize for 8th-grade students. Our work is often created with handset, antique wood, and metal type. We like inventing projects that have a twist that keeps them from being like anything else we've ever seen. if you're after something more historically accurate, OR perhaps something contemporary with that letterpress je ne sais quoi, you'll find both options available at Lead Graffiti. Honestly, sometimes they don't quite work out. But every experiment and failure can be put on our shelf of ideas to be pulled down, massaged and spread across another sheet of paper at another time. We want to get to a place where we can say, "We're glad we went there." Sometimes it is the piece. Sometimes it is the story. PROJECTS WITH A SENSE OF PERMANENCE, where the piece is a keepsake, and where possession of it makes others feel connected to you, are ideal for letterpress, whatever your style or quantity, from one of a kind to a thousand or more copies. Contact us if you think you've got a contender that will at least get us closer to those goals. When I taught I often talked about the importance of experiences and ideas as stepping stones to new experiences and ideas. Once on a field trip to Hagley Museum and Library to see an exhibition of designer Raymond Loewy, the group walked to the Brandywine River which runs next to the exhibition space. I got all of the students to stand on exposed rocks to create an illustration of "stepping stones." It didn't take long for someone from Hagley to tell us we weren't allowed on the rocks. Too late. I already had the photo. Turns out my camera wasn't focusing right. Still a fun experience. The photo at the top is taken from near the same spot, but at this point 16 years later the rocks have moved a lot and the arrangement was nearly so photogenic. Oh, well. Here is a Hockneyish photograph of the group of students acting out on stepping stones.